For the 2014 systemic review of vaccine safety described above, see here. Vaccines have never been safer than they are today. The safety and effectiveness of vaccines are under constant study. Vaccines are designed to be given routinely when a child is well, so they must be extraordinarily safe. Safety testing begins as soon as a new vaccine is contemplated, continues until it is approved for use, and is monitored indefinitely after that. All vaccines must pass stringent safety testing before being approved for use. This testing is required by law and is done over many years during the vaccine’s development. They are rigorously tested in many thousands of people in progressively larger clinical trials. These trials are strictly monitored for safety. The development process can take up 20 years, and the approval process usually takes 1-2 years. As a result of such detailed testing, a number of vaccines fail in these early tests, and are never released. This link explores in much greater details how safety and efficacy are incorporated into vaccination research and development. Once the vaccine is in general use the vigilance continues. 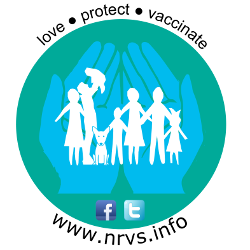 In Australia any and all possible reactions to a vaccine should be reported to the Therapeutic Goods Administration (TGA) via this link. Other countries have their own safety reporting system, such as the VAERS in the USA, or the Yellow Card scheme in the UK. One thing they all have in common is that anyone can report any possible reaction, no matter how minor. they do not include all of the different types of people who might eventually use the medicine and who might be more susceptible to some adverse events, such as older people, children, pregnant women, or people with other medical conditions. There are equivalent agencies to the TGA around the world, all of whom monitor the safety of all medicines and vaccines in use. It is via this international and extensive reporting system that an analysis of all medicines and vaccines available can occur. The purpose of this analysis is to determine if adverse events occurring around the same time as vaccinations are caused by the vaccine, or occur as a coincidence. The difference between an adverse event and a vaccination occurring together as a coincidence (also known as correlation) and an adverse event being caused by a vaccination (also known as causation) is a vital concept to understand when considering potential adverse effects. It is not possible to determine this if you are only aware of small numbers of individuals and their anecdotes, no matter how powerful you may feel that anecdote to be. It is only through looking at the science, and large numbers, that this can be determined. For example; if a person is wearing red socks, and they get hit by a bus, a question can be asked — did the red socks cause the bus accident to happen, or are those two things a coincidence? Is there a plausible explanation for one thing to cause the other? ie, scientifically, is there any way that wearing red socks could lead to an increased chance of being hit by a bus? To answer point 1 we need to look to the science, which in this example would include the way that the accident occurred, and any potential role that sock colour could have in that. With vaccinations, this means looking scientifically to how the body works, and the way the vaccine works. And this is done extensively, both in the production phase, and, whether or not there is a suspicion of an adverse event, after the vaccine is released. To answer point 2 we need to look at statistics, not anecdotes. In other words, you may have actually had two friends, both of whom were unfortunately hit by a bus, and both of whom were wearing red socks. With that, you are concerned that wearing red socks is a dangerous thing to do. You are making that judgment based on anecdote, and coincidence. What science does, however, is look at ALL people hit by buses over a whole year within a certain geographical area, and record their sock colour at the time. It also records the proportion of people who wear red socks in the general population (not just those having been hit by buses). Then the two rates are compared, and it can be determined if bus accidents occur more in red sock wearers than expected in the general population. Only if it is found that there is a higher than expected number of bus accidents in red sock wears, or that red sock wearers are more likely to have bus accidents, could the two things be linked by causation. What then would occur is much further study to confirm that the findings are reproducible, and to try and determine the mechanism. However (as is likely in this example), if when looking at large numbers it is determined that the rates of bus accidents are the same irrelevant of sock colour, then the red sock/bus accident observation that you noted can be said to be a coincidence, and the accident was not caused by the socks. Persuading the individual who has witnessed an anecdote can be very difficult. This is very understandable, as having to believe science, written on paper, over something that you have witnessed yourself, no matter how strong the data, and how ludicrous the connection/coincidence, can be extremely difficult. Never the less. Science is based on fact, and not on memory, on opinion, or on feelings. And if the science proves, or disproves an anecdote, then that anecdote is just that. A coincidence. For example, we know from the science, and from the statistics that autism is NOT caused by vaccination, but that autism often comes to light at the same age as vaccines are given. In other words, a parent often notices the first signs of their child having autism at about the same time that their child receives a vaccination ie there is a coincidence of timing, but the science, the biological mechanisms, and the hard population data and statistics show that one is not caused by the other. What we know, from the data that is collected, is that adverse reactions to vaccines do occur. But for the most part, they are very minor (such as a sore arm, or a mild and transient fever). More serious adverse reactions do occur, such as serious allergic reactions (anaphylaxis), but they are much rarer, and far less likely to occur than adverse reactions to vaccine preventable diseases. 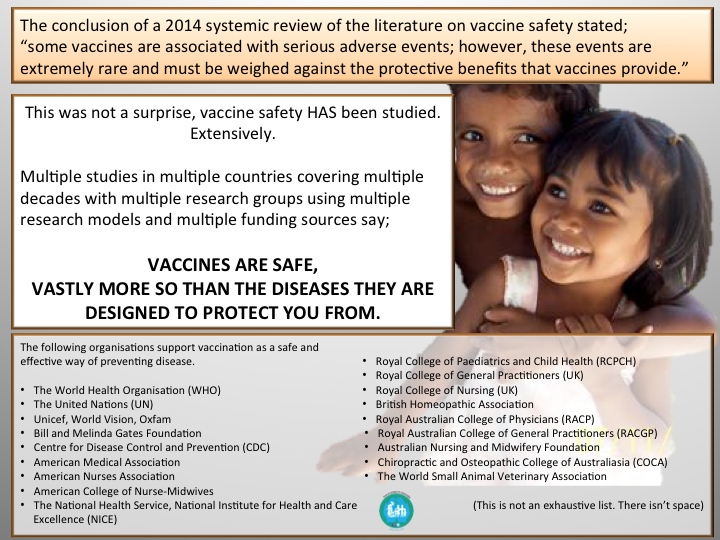 A 2014 comprehensive summary looking at all the evidence regarding vaccine safety can be found here.